We are excited to announce a new designer/builder has joined the Revision Division team! David Spangler grew up in Port Townsend, WA, where he was surrounded by local history, Queen Anne buildings, and antiques. He was also exposed to the woodshop early on by his wood working father, who made furniture and toys. As children, David and his brother were always on the hunt for found objects for use in their play. In his early twenties, David started creating miniature architectural buildings from found objects (examples, below right), branching out later to build several larger wall hanging architectural art pieces from salvaged building materials. A Bellingham resident since 1988, David found his way to The RE Store in 1995 and has been working for us, off and on, ever since. In 1998, he fabricated a series of little repurposed bookshelves from salvaged materials, then moved on to start an earth friendly debris hauling business that ran for over seven years. His dreams of rethinking unwanted building materials continued to brew. 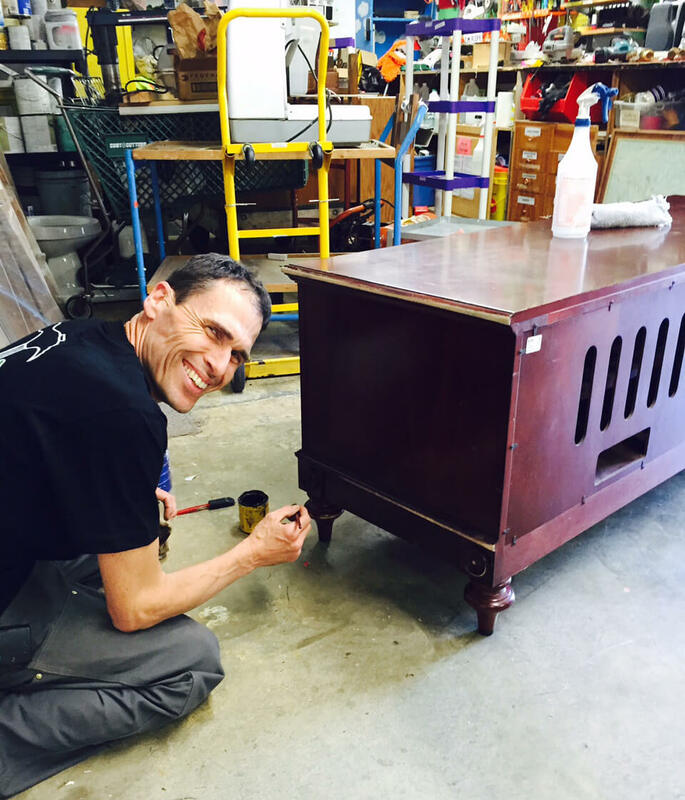 Returning to work for The RE Store in 2006, and still interested in finding new life for low value discarded materials, David implemented The RE Store’s successful furniture repair program in December of 2013 that continues today. Ever excited about upcycling, and the creation, design, and building of products based off of unwanted materials, he joined the Revision Division team in February, 2015, where his varied expertise is helping us grow this program. 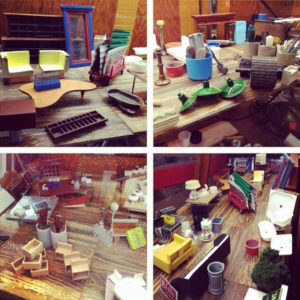 Check out our Revision Division showroom to see our latest repurposed and upcycled furnishings, or come get ideas and ask questions about your own projects – and give David a warm welcome to the Revision Division team!